Đình Lưu Communal House before the incident. THÁI BÌNH — A huge fire at around 10am on Monday destroyed a 340-year-old communal house, recognised as a National Historical Relic Site. 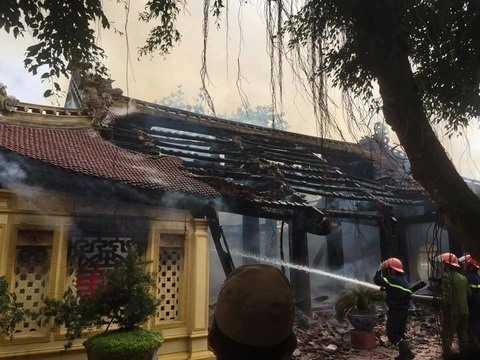 Locals discovered a fire had started in the main worship room at Đình Lưu Communal House in Đông Phương Commune, Đông Hưng District, in the northern province of Thái Bình. The fire soon spreaded to neighbouring rooms. People inside the House managed to get out in time, therefore there were no casualties. However, most of the wooden architecture collapsed following the incident. Local authorities sent two fire engines to extinguish the fire, but it was only by 2pm on the same day that the fire was completed put out. 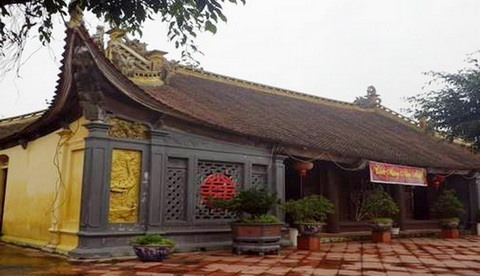 Đình Lưu Communal House was built in 1670 in a traditional design with three main rooms and two wings. All its pillars are made of lim (iron) wood. The House worships Nam Hải Đại Vương (Sea God). The architecture has been upgraded several times. It hosts several valuable royal documents dating back to the Nguyễn Dynasty (1892-1945). The fire occurred when the architecture was being upgraded, hence all items had been moved to another place. There was no loss of property. Firemen work at the site and put out the fire three hours later.